← Writing – Point of View Problems – What a Palaver! Writing – Embracing Characterisation in a haunted, Victorian Prison. 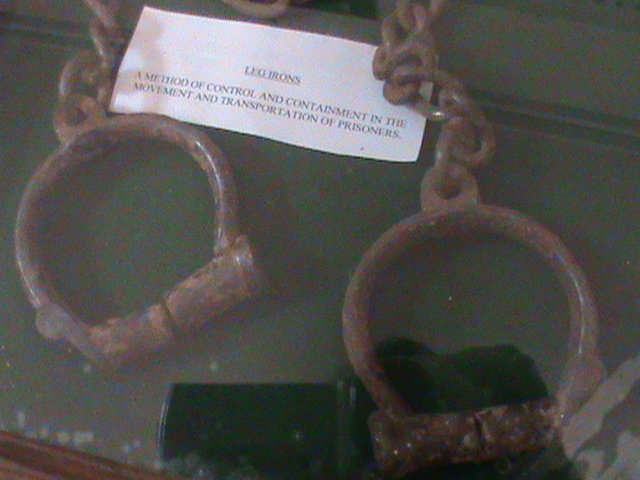 Handcuffs on display at Lincoln Victorian Prison in Lincoln Castle. I am working on a novel called Mulgrave Castle in which my main character Harriet Twine is a psychic, Victorian detective. In order to really embrace my character as I re-write, I wanted to visit a place I had been to before which I knew had both a mixture of atmosphere and spiritual energy. It is the Victorian prison in Lincoln castle. 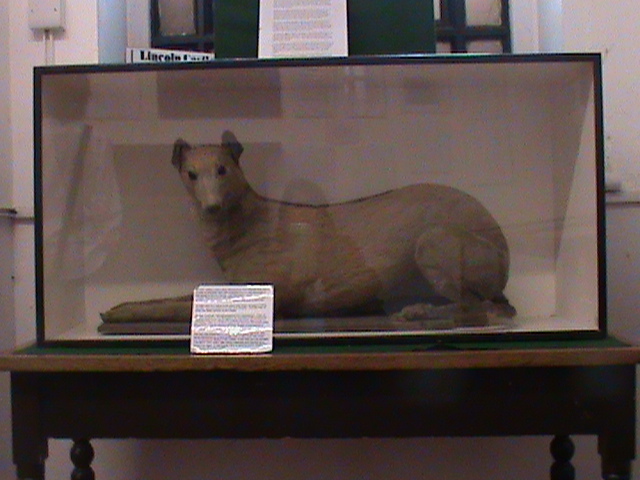 A faithful dog on display at the prison. His master was a poacher who shot a head keeper in the knee. Unfortunately, the man died and William Clark alias Slenderman was hanged for it at Lincoln Prison in 1877. I decided to do most of my journey by train as this was a popular Victorian mode of transport. I would have liked to do the whole day in Victorian costume but after doing other experiments in costume, I decided it really was not practical and I would have to use my imagination as far as clothing went. I have written about the prison elsewhere on the site under Exciting Excursions. The place which impressed me most on my last visit is the prison chapel. In 1849 the Separate System came into force. It was believed that if prisoners were kept in isolation they would become rehabilitated. They were only let out of their cells to go to the Chapel and for exercise. It is said to be the only one of its kind left in the world. The Separate System meant that the inmates would sit in closed in seats, in The Chapel, so that they could not see or speak to anyone else. 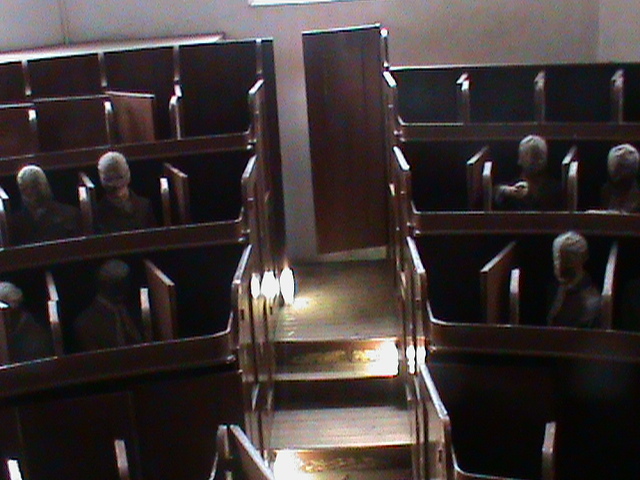 The seats are tilted, therefore if any prisoners dared to fall asleep during a sermon they would fall forward and be punished. There was an open bench at the back which was especially for condemned criminals; obviously it was thought that they were beyond redemption. Debtors also were not included in the separate system and they would be seated in the gallery with the men above and the female debtors below. There were sloping seats at the front for the women. Each criminal in the Separate System was locked into his seat before another could be let in. In addition to not being allowed to see others, the prisoners also had to wear masks to cover their faces. In 1851, it was realized that this system did not work and it was abandoned. This is the only chapel of this kind left in the world. The remarkable aspect of all this is that visitors to the chapel today can stand in the pulpit and have the view which the prison chaplain would have. 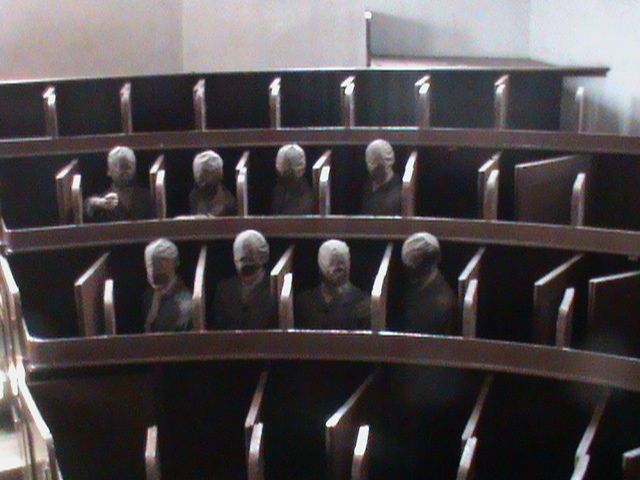 Some seats are fitted with a dummy criminal wearing a mask. The vision is intimidating and the atmosphere is awful and on my first visit it gave me shivers down my back. This is the view from the pulpit. For this visit, I had strongly psyched myself up not to be so intimidated by the chapel, after all, Harriet is Victorian and has never witnessed the liberal world which I am used to. As I stood in the pulpit looking down on the chapel to take the photographs, I felt a very strong sensation which made me lean backwards so that I could not be pushed. I put that down to my own imagination and went down into the seats and sat on the front row. I had not planned to do this but I found that I was sitting observing the other visitors. People seemed reluctant to stay in the chapel, I found that most were scuttling straight through and not visiting the pulpit. They seemed as if they should not be in there and were frightened of getting caught. I decided to stop the next visitors and explain about the pulpit and directed them up to it. They didn’t look happy and didn’t actually climb into the box. So as the next people I directed up there were sneaking off, I pointed the pulpit out. They declined going in. I eventually witnessed one couple going in and their faces suggested they had eaten something which had gone off. I felt at this point that my experiment had worked in that I had become like my intrepid Victorian heroine compared to the other visitors, I had lost my modern day queasiness for harder times than ours. 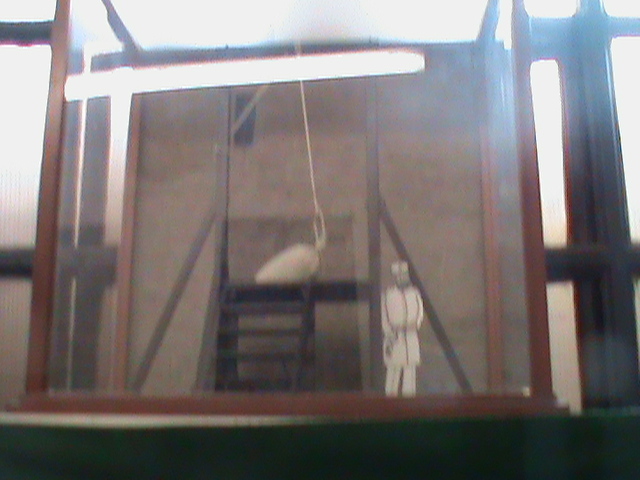 A display portraying the gallows just in case we forget what took place in Lincoln Prison. However, all of that fell by the wayside when I entered Cobb Hall which was built in the 13th century and has been used as a prison and for executions. The stench of urine as I entered was overwhelming which puzzled me, later it actually made sense as when people are extremely frightened it is not unknown for them to wet themselves. 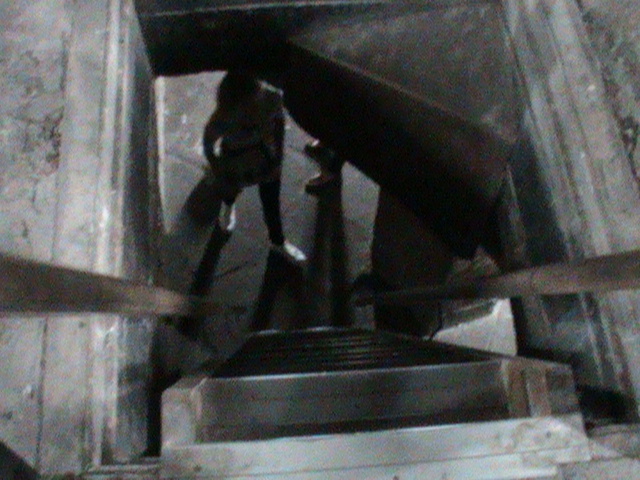 There is a ladder which leads down to the dungeon and there was very strong negative energy emanating from that area so I declined to go down. I felt rather ashamed at that point as Harriet would definitely have gone down to try to find out what had happened down there. For me however, the feeling of evil was too strong. I did climb up to the top where the hangings took place. In the mode of Victorian psychic detective, I did not sense anything there. For many, when they went through those doors – they never came out again alive. Whilst I was up at the top, unbeknown to me, my son had entered Cobb Hall seen the ladder area leading down to the dungeon and had left immediately, he too got a really negative feeling from that area and rushed to tell me about it as I left Cobb Hall. Down into the dungeon. There is a malevolent energy around this spot. Did my experiment work? I feel it did as I think that I have discovered that Harriet is rather more adventurous than I am. I have discovered that leading a life as a sheltered Victorian lady has made her more likely to throw herself into situations because her life is dull and it is not enough for her. Do you ever do experiments like this? If so, please tell so that I know that I am not the only one hanging around Victorian prisons. 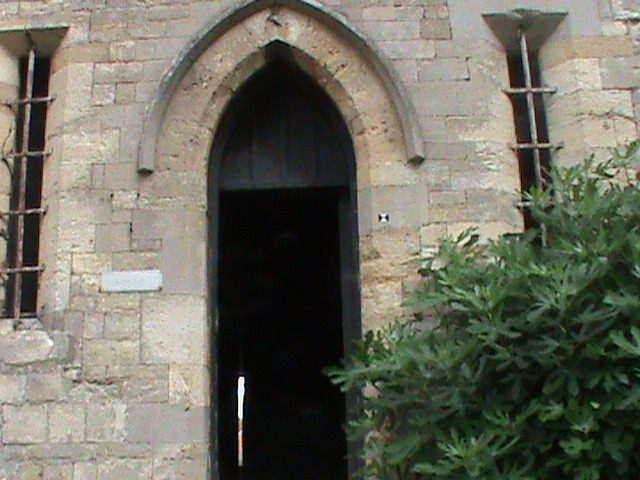 I’ve visited the prisoners chapel too – it’s totally freaky – we didn’t hang about long! But you’re not the only one hanging round strange places looking for inspiration, I do it too. and often start scribbling which seems to make anyone else visiting feel very guilty and scuttle off. Perhaps they think I’m writing about their misdemeanours! Ha Ha, trust you to make me laugh. Yes, you have to go to the prisoners’ chapel to realise how freaky it is. It is funny how people give funny looks when scribbling notes down – all I can say is that there are a lot of guilty folk about. This is wonderful. I love doing hands-on research, and if I were writing about something to do with Victorian prisons I would have done exactly as you had done. That’s amazing that you can still smell the stench of urine after all these years. And the sense of evil? Oh my goodness, nope, I couldn’t have gone down there either. I’m so glad that I am not the only one who decided to avoid the dungeon – I also love hands on research, it really helps me see how truly different peoples’ lives were in different times. Sometimes though, I can’t believe how cruel people were to each other – it upsets me a lot. Don’t worry, I would probably do the same if I lived there too but this is fascinating. I read about this Separate System before but never knew of Lincoln Prison’s uniqueness. Amazing still, is the stench of urine. (Sorry but the cynical side of me has to ask, the prison is closed and secure at night right? No vagabonds?). I keep hearing about Downton Abbey on Twitter, is it a drama series? I’ve been on so many ghost-hunting expeditions that I’ve never come across people who have reacted the way those visitors did. Lincoln Castle has got me intrigued now. And to think I was right there! Damn! Downton Abbey is a historical drama which is now starting its, I think, 3rd series. It started in the late Victorian period and is now in about 1920 I think. Maggies Smith is in it and she is fabulous. I think that you would like it. I would love to hear about your ghost hunting expeditions. I would love to do something like this. What an imaginative, passion, creative person you are. I am more inspired to think outside of the box every time I visit looneyliterature. What a wonderful thing to say – you have made my day. Thank you. Yes very interesting another interest of mine is prisons. Those in the past would have been terrible. There are prisons of today that are questionable today that’s for sure along with the justice system. I can really relate to your needing to investigate in the way that you do, to try and feel and soak in as much as is possible and to experiment. I went to visit a prisoner in 2004 that had wrongfully been imprisoned at a penitentiary that had the reputation of being one of the bloodiest prisons in American. It was Louisiana State Penitentiary. I have been in contact with this prisoner for over a decade and along the way he has quite a supportive team trying to get him released. It was a really surreal experience going through the process etc, long story. Anyway I look forward to you book, I love anything set in the UK and from a past era. That sounds like such an experience – I would love to hear the whole story. We will go to the Lincoln prison next time you come to the UK. I would appreciate you soaking up the atmosphere and telling me how it made you feel. Cobb Hall definitely has a dangerous presence in it. i live 2 minutes from Lincoln castle and can assure you it is very secure at night and is well maintained so it is an odd thing to smell. The area is beautiful but does have a lot of history; gruesome history at that. Whether you believe in the after life or not, i find the programme Most haunted quite fascinating as their visit described some of the history for you. it is on youtube – most haunted – lincoln prison. There are many ghost stories linked with the castle and the cathedral; sat opposite. there is also a bishops palace and monkss abbey close by; oh there is also the lawns – an old insane asylum, which has now been converted, but the original buildings and land are there. and if you want a good ghost story, then look up the white hart hotel; it dates back to highway men era and is noted to have around 13-16 spirits. Tunnels link the castle with the cathedral and a local pub – the pub which the condemned where taken to enjoy their last drink before being executed by public hanging the morning after. your visit is a great read and your experiences are fantastic. he chapel and prison itself are brilliant to experience on a personal level; i have been in the seperate cells many times and even if you do not believe in ghosts; to be that isolated, even for minutes; you can see why many inmates went insane. i must admit, out of the many times i have visited the castle – school trips, taking friends, my graduation – i have only been down into the Cobb Hall dungeons twice; it is small with very slight slit windows; it is cold and has scratch marks in the wall; initials and birthdates and marks where someone has clearly tallied up their days; there is also hook on the wall where the prisons could be chained to. these are solid and heavy, no wind could move them and trust me, they take effort to move with your hand – yet i have seen one rattle. i purposely brushed past one to see if this would make it shake— nope! Fair to say i have not been back since, it is a sad and depressing area and nothing but negative feelings come from it. Hello, thank you so much for your wonderful comments. I didn’t know about the tunnel or the White Hart pub so I’m going to be looking into those and following your links when I’ve typed this. I also, found your experience in Cobb Hall really interesting and brave, I really don’t think I could go down there – it virtually warned me to keep out. I adore Lincoln and think you are so lucky to live near to it. I went to the prison in Lincoln with my boyfriend and his dad, we didn’t stay that long as there was something very scary down there, despite the horrible feelings we had an absolutely amazing time learning about prison life and the history of the prison! I’m so glad that you enjoyed it even though you felt the oppressive atmosphere there.